Marvel Movie Marathon: Dark World: this is much less bad than I remember. Like, if I had to choose between watching it again and watching Iron Man 3 again I’d definitely choose Dark World. 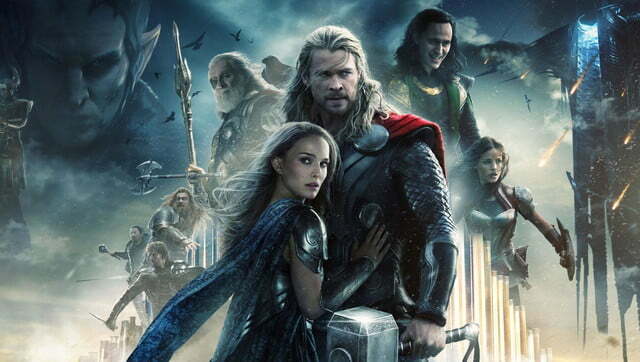 Dark World is the second Marvel movie I hadn’t rewatched, although I’d rewatched parts of it. Going in a second time, I remembered it as half a good movie (the Thor & Loki Road Show) & half a bad movie (everything else), but honestly, it’s not that bad. It’s not *great*, and I think the Space Elvess are probably still just a really bad idea (and I’m sorry, but Doctor Who or not, Christopher Eccleston should not take/be cast in roles he has contempt for), but it’s a lot less awful than I remember it being. Poor Natalie Portman is mostly not given anything great to do–she’s much more Damsel-y in this than in Thor–although in retrospect she’s apparently made of solid brass balls, because she manages to contain the power of an Infinity Stone for days before having it ripped out of her. And she also gets to deliver the most satisfying slap (punch?) in the MCU, when she decks Loki. And she does get to be funny again, before the Aether gets hold of her and reduces her to Fainting Damsel. And I *want* Natalie Portman to get to be funny, and to be able to loosen up, and do the things that were taken away from her thanks to instant childhood fame. So I appreciate that. Poor Chris Hemsworth does not get to spend nearly enough time half naked. I mean, come on, he worked so hard for it, surely we should get to appreciate his effort a little longer, right? I’m sure I’m not being selfish here. But he’s actually quite good being the mopeish lovelorn prince, and then the chemistry between him and Tom Hiddleston, well, I mean. *just throws my hands up* You know what I mean, right? I mean, ye gods. But really, I’m impressed at how much maturity Thor’s achieved over the course of his three movies so far. It’s a big change, and it’s cool to watch the character arc. There is no ‘poor’ appended to Tom Hiddleston in this film. He just gets to go straight for the bone and hangs on savagely throughout. Like: in Thor, Loki uses the illusions on him and in Avengers he asks if Thor will ever not fall for that, right? And I was like “hahahaha it paid off!” in Ragnarok, except it turns out it pays off in Dark World, too: “No more illusions, brother!” So Thor *does* see through it, which means in Ragnarok Loki ought to be prepared…but the thing is, of course, Loki’s not really willing to see that Thor has changed, and he’s never been able to see that regardless of what Odin thinks, Thor has always loved him best. “Trust my rage,” is one of his strongest lines, and–I mean, he knows he got Frigga killed. That rage is real. And speaking of Frigga…I’ll never forgive them for killing her, but the fact that she died in defense of Jane, a woman she’d just met, but mostly importantly, a woman, is pretty good. It’s not very often we get to see women defending other women in film, especially in battle, and we got a lot of it on a lot of levels in this movie. Jane/Darcy, Jane/Frigga, even Jane/Sif, although Sif is SO JEALOUS of Jane. So that’s a real strength of the film, and I appreciate it. Next Post: we’ve moved house! !